If you ever hung around a person who did CrossFit, the word Paleo will most likely come up…a lot. Paleo (Paleolithic), or the Caveman diet, basically says that what the cavemen ate (pre agricultural development) is what our bodies were really meant to process, and therefore these types of foods are the most ideal (Paleolithic Diet, Wikipedia). Now, why Paleo and CrossFit are so intertwined, I’m not 100% sure. Perhaps it’s because the severe restrictions on processed foods and all things carbs, coupled with the sudden onslaught of constant intense strength and cardio workouts, lead to rapid weight loss and an increase in muscle development and toning. While I have watched my brother take on the Paleo 30 day challenge, and lose a significant amount of weight, I’m still not sold. Any new diet coupled with increased intense exercise will lead to the same result. To lose weight and to get stronger, it isn’t just one or the other. It has to be both exercise and diet, and to make it stick, it has to be a life style change, which takes time, commitment and an understanding of the underlying reasons for what works and why. 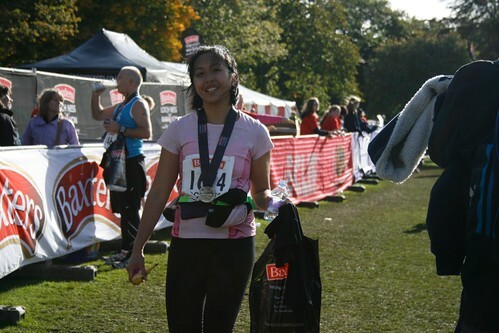 My own initial transformation happened over many years (I made that conscious decision 8 years ago), where it was a gradual adaptation of exercise and accumulation of nutrition knowledge that got me from a size 12 huffing and puffing up stairs to size 4 marathoner who loves all things active. Even with my recent weight gain, I am back, weight wise to where I started, but as size 6. It was not an overnight success, it was not a 30 day challenge, it was a multi-year process and a lot of patience and learning. A process that is continuous and ever changing. Now, I find myself at another crossroads. As the weight is slowly starting to creep on and my exercise routine has slowed down and changing, I am getting older and my metabolism has noticeably slowed down. So, what is a girl woman to do? I could jump on the Paleo wagon and give it a try. However, as much as a quick fix as it might be, I don’t see it working for me in the long term. It also does not help that I don’t believe in many of the restrictions it places on something like vegetables. I don’t eat a lot of meat to begin with, so to restrict soy and beans from my diet would severely limit my protein sources. While I do believe, coupled with a regular exercise routine, Paleo is a great diet for someone who is coming from a generally poor diet filled with take out and processed first world type foods, I do not believe it is as beneficial for someone who generally already has a healthy, nutrient dense diet. While I cannot say I have the most optimal diet (you read this blog, you see what I like to bake), there are a few things I agree with and have incorporated into my own diet. So, besides converting me to drinking my coffee black, and turning me to Almond milk (I still eat yogurt and oatmeal…staple breakfast items for me), I’ve also been cutting down my pasta and rice intake. Unfortunately, being Chinese, it is also a big part of our diet. My ancestors ate huge bowls of rice because they worked the fields all day, and didn’t have a lot of food to eat besides that. I don’t work the fields, and have a variety of other more nutritious foods available to me, so therefore, there is no need for me to eat a bowl of rice with my dinner. But sometimes you just need that blank canvas grain to serve as a base. Quinoa is a good grain, but it’s expensive. So, I was intrigued when my youngest brother mentioned something about using cauliflower as a rice substitute. Those Paleo followers are quite the creative bunch (plus they taught me how to make whipped coconut cream!). Why not use cauliflower? As you may recall, I already used cauliflower as a substitute for the cream and flour in Mac & Cheese to pretty palatable success. Now, I must try this Cauliflower rice. Give the cauliflower a good wash and dry. 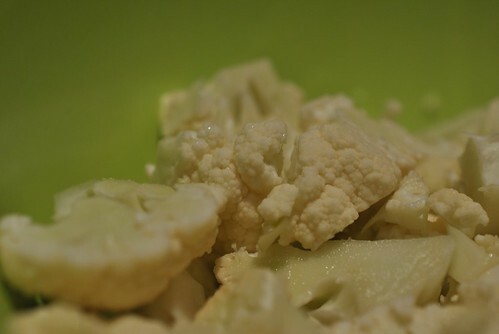 Remove the bottom green stuff and chop the cauliflower into small chunks. Put the chunks into a food processor and pulse a few times until it resembles tiny rice like pieces. Pour the pieces into a microwave proof bowl. Cover the bowl (I used clear plastic wrap) and microwave for about 5 minutes. Remove the plastic wrap (carefully..there’s quite a bit of hot steam that comes out, very quickly). Season the cauliflower with whatever your heart desires. For me, I was in Flushing, Queen the other day and bought a scallion poached chicken and had it chopped into two containers. Each container came with two of those ginger scallion mini containers for additional seasoning when you eat the chicken. Since, for my dinner (my brother was here for dinner too), I was having one of the containers of chicken along with some roasted veggies (Japanese sweet potato, carrot, onion and apple), I thought it would be fun to season the “rice” with the ginger scallion. I was right…it was delicious. 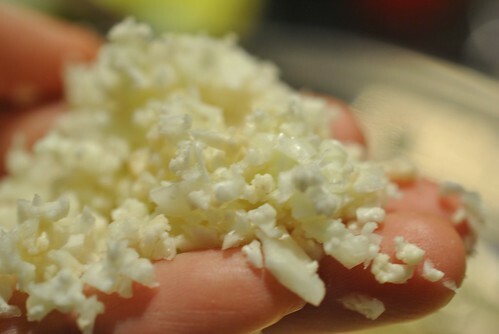 The cauliflower provided a nice base to the meal, and the texture was just right to act as a grain without being one. Nutritionally, a much wiser choice than rice, and taking no more than 10 minutes start to finish, so much easier and faster than making rice. Hopefully since this cold snap is over, I can get back to those pre-dawn runs again! Hopefully…. This entry was posted in Dinner, Uncategorized, Vegetable and tagged Cauliflower, Crossfit, Diet, Exercise, Paleo, Rice. Bookmark the permalink. It was interesting to read this particular post, considering what I blogged today – check it out. I hear ya, but I’m in a learning phase as well. Good luck! The one thing I do commend Paleo for is, it makes people think a lot about what they are eating and how it makes them feel…like how you are now discovering for yourself. Good luck with it and hopefully you learn a lot about what works for you! Totally agree with that! There are some things that are conflicting for me, but I’m willing to try for the moment…if anything, to discover just as how you stated above. Either way is really a win in this scenario! I totally agree with you there. 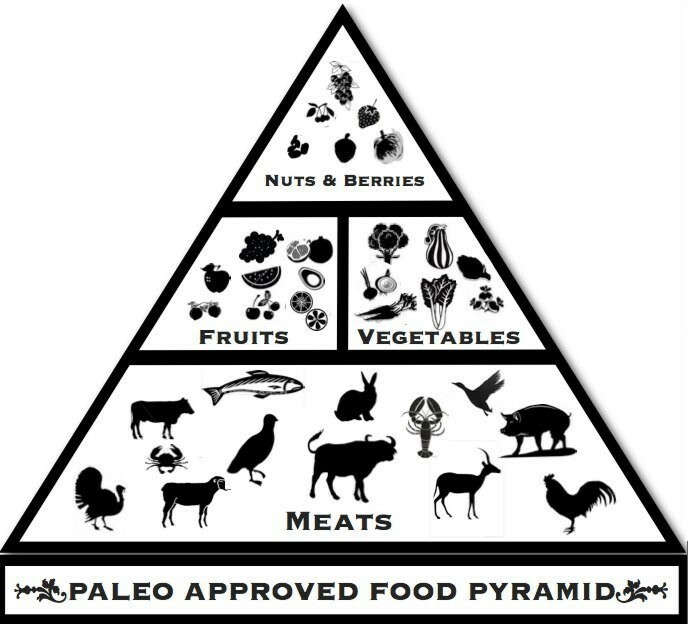 =) When I first heard about the Paleo diet, I thought it was absurd. We live in a different era surrounded by frozen foods and canned goods in the supermarket. Majority of the meats and produce we buy are filled with additives. When you start hunting your own meat and growing your own vegetables, then I would call that a true Paleo diet. Also, you cannot starve your mind of carbs. Carbohydrates break down into glucose and glucose is sugar. As much as people bash carbs, it is a healthier choice of sugar. I say moderation is always the key. I totally agree. Moderation is definitely key. When I train for longer distance races, I do have to incorporate more carbs into my diet because I need more fuel. Besides, carbs is also such a general term that encompasses so many different types (ie complex, simple), you just can’t overgeneralize and vow to cut out carbs completely.